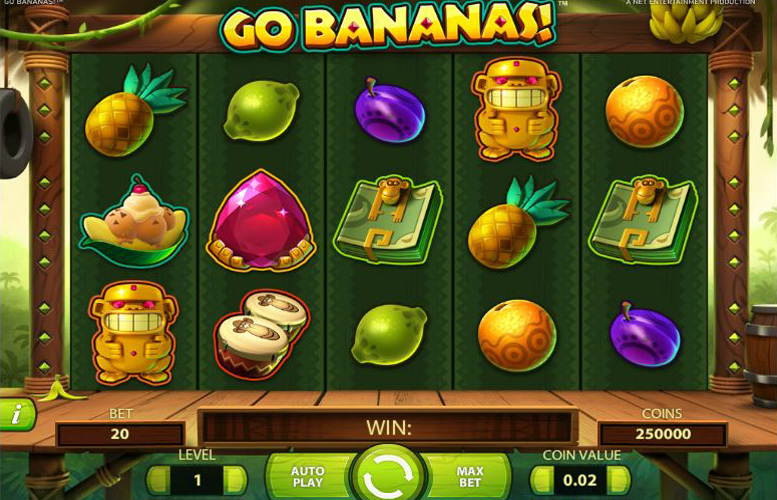 Fun and fruity, the Go Bananas slot is a really simple and attractive game with just a few key features. To find out everything you could possibly want to know about it, simply read on through our guide to the top jackpot, special symbols, paytable and betting limits. 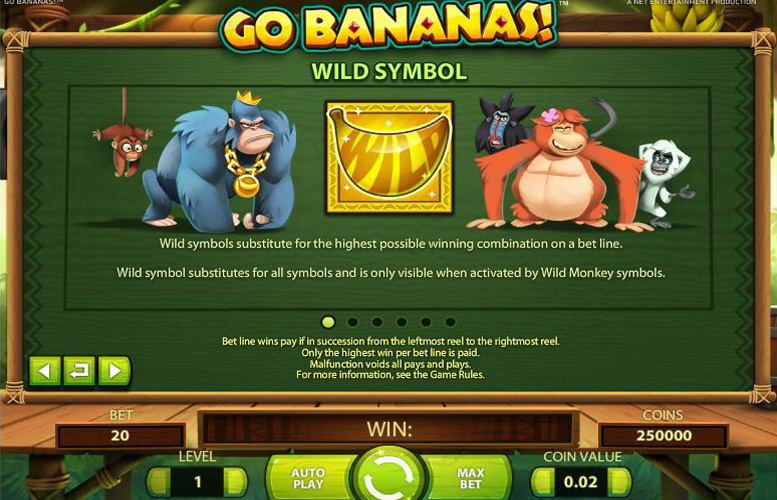 Arguably the main selling point of Go Bananas, the game does have a very impressive top jackpot which can be achieved if all 20 paylines are filled out by the most valuable symbol within the game. That symbol is the large ruby gemstone symbol and pays out winnings equal to 700 times the current bet level. If the bet level is set at the maximum of ten therefore, a payline consisting of five ruby symbols will pay 7000 coins which at the top coin value of £1 is worth £7,000. Subsequently, if all 20 paylines simultaneously display the same combination, the jackpot will be multiplied by 20, giving a total payout of 140,000 coins (or £140,000 at the highest coin value). All serve to turn a collection of adjacent symbols into wilds. Which symbols are turned into wilds depends upon which of the ‘Wild Monkeys’ symbols appears and the patterns that they transform are explained within the game’s paytable. All created wilds however, similarly substitute for all other symbols and always create the most valuable possible combination for a winning payline. The ‘Wild Gorilla’ symbol can only appear on reels 2, 3 or 4, whilst all the others can appear on any reel at any time. The symbols found on the reels of the Go Bananas slot are all largely jungle themed but the most valuable of them depicts a large ruby gemstone. If a player achieves five of those symbols from left to right along a payline, they will win an amount in coins equal to 700 times their current bet level. At bet level ten therefore, that five rubies combination will pay 7000 coins and if it is seen on all 20 paylines at once that will result in the overall top jackpot of 140,000 coins being achieved. The next most valuable symbol within the game depicts a golden monkey figurine, and five of those in combination pays out at a level of 350 times the bet level. That makes the payout for that particular combination exactly half as valuable as the top jackpot (70,000 coins). 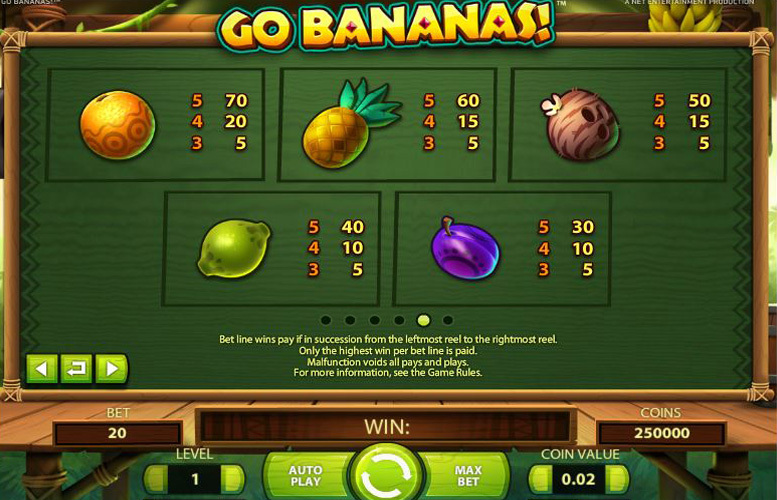 The 20 paylines of the Go Bananas slot are all always active but a player can control how much they bet per spin by setting a coin value of between 1p and £1 and a bet level of between one and ten, which determines how many coins are bet per line. At the lowest end of the spectrum therefore, a player could bet a total of 20p per spin (one 1p coin per line) and at the upper end, they can choose to bet as much as £200 per spin (ten £1 coins per line). The eight further bet levels and five further coin value settings between these extremes, then give players a whole host of options when it comes to what they wish to wager. It would be fair to say that Go Bananas is not going to be a slot game that appeals to everyone. Any player who is looking for a varied, exciting and engrossing slot that is packed full of bonus rounds and special features for instance, needs to look elsewhere. 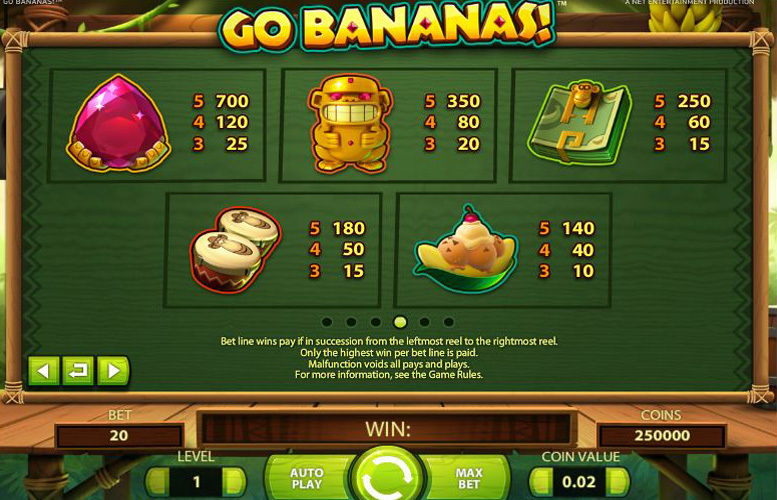 Go Bananas is a very simple slot which consists solely of its main game and does not have any feature rounds or even a free spins function. What it does have however, is the potential to pay out very high jackpot amounts with the theoretical top jackpot worth £140,000 ranking among the most impressive around. This game has a rating of 5 / 5 with 523 total reviews by the users.